The Vegan Instant Pot Cookbook and Pre-Order! A little over a month ago, I revealed that I was writing a cookbook—The Vegan Instant Pot Cookbook: Wholesome, Indulgent Plant-Based Recipes—but I realized I never shared very many details with you all. So let’s dive in, shall we? It has been exactly 10 months since I first signed my contract with Penguin Random House / Avery Books to write this book, which feels like sooo long ago! It’s possible it feels like so long ago because I went through a really intense period for five months. Between writing the book and holding down my full-time job, the 14-hour work days (sometimes, 16-hour work days) became normal; there were countless three-grocery-store-trips-in-a-day, which can be cumbersome when you live in New York City and your method of getting around is your own two feet and a backpack; there were a fews days when I didn’t leave the house and had zero human contact (do podcasts count as human contact? ); and there were days when I was just so exhausted that I would forget to shower. BUT, writing this book was also the MOST rewarding thing I have ever done and all of that hard work was SO worth it! The entire process—from devising and testing recipes, to styling and photographing the dishes, to writing the actual book—tested my resolve, my ambition, and my skills as a chef and photographer, and at the end of the process, I came out more resolved, more ambitious, and more skilled. That’s why I could not be more excited to share the final result with you all! Before I get into the substance of the book, I want to say THANK YOU. Whether you read my blog, follow me on Instagram, or watch my Youtube videos, I appreciate the hell out of your support! Writing a cookbook has been a dream of mine since I learned how to cook as a teenager, and my dream would never have come to fruition without your love and support! To say thank you, I’ll be doing a few things. First, I’ll be sharing a few recipes from my book between now and release date! The recipes will live on the blog, and I’ll be announcing them via my newsletter, so make sure you’re subscribed to the blog to get notified! The first recipe from the book that I am sharing is my Banana Bread with Walnut Streusel. And second, I have some extra surprises to say thank you, so keep reading until the end of the post to find out! Order the vegan instant pot cookbook! Tell me more about your cookbook! A robust and detailed section on how to use, understand, and troubleshoot the Instant Pot, along with recommended accessories and kitchen tools, and a FAQ section. I highly recommend reading this section before you get started with the Instant Pot. Another robust section on my fundamental principles of cooking, my personal secrets to creating incredibly flavorful vegan food, and tips on stocking a vegan pantry. I also recommend reading this section before you get to cooking because there are lots of tips and tricks you don’t want to miss! Comfort food recipes that taste indulgent and will wow your taste buds but are secretly wholesome and nourishing. No boring or bland “health food” here! A book full of recipes that will delight vegans and surprise non-vegans! How can I pre-order your cookbook? 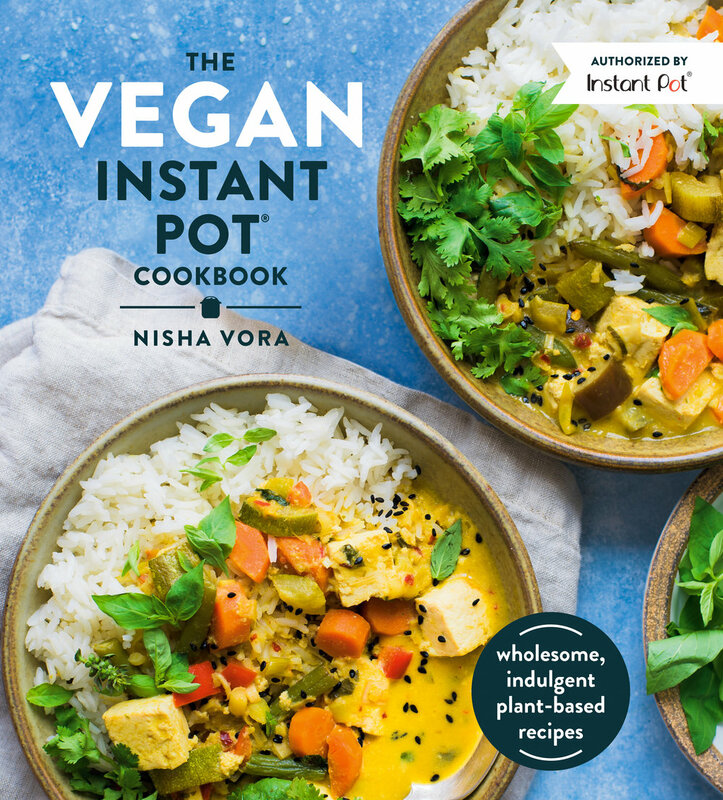 You can pre-order The Vegan Instant Pot Cookbook now! It will be published on June 11, 2019 (the official date it goes on sale), but you can and should reserve your copy now! Then you’ll be one of the first people to receive the book on June 11, the actual publication date! All you need to do is head to Amazon (or Barnes and Noble or another online retailer). I’ve included links to my book on some common retailers below, and you can find a few more retailers on the Cookbook page on my website: https://www.rainbowplantlife.com/instant-pot-vegan-cookbook. Why should I pre-order your cookbook? For one, I will be offering FREE EXCLUSIVE BONUS CONTENT to anyone who pre-orders my book! I’m still finalizing these free goodies, but they are going to be awesome and you don’t want to miss them! I’ll update this blog post once this bonus content is available. So don’t delete those order email confirmations :) And if you’ve already pre-ordered, you’re still eligible to receive the bonus content. Plus, if I can be honest, if you want to support me and the work I do with RainbowPlantLife, then pre-ordering is the BEST thing you can do to support me! I appreciate your support SO much and am so grateful to have this opportunity.